In the UAE, people love good deals. 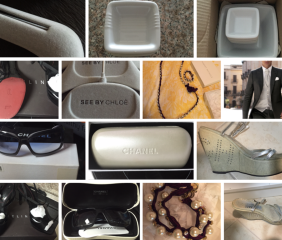 In this series, we will highlight amazing preloved items from our Mellsters (Melltoo users). They are your neightboors, your friends, your colleagues. Each day we will pick good deals from the app and promote them to our different social media plateforms. 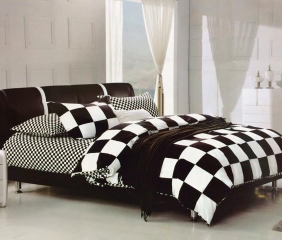 Kind size bed with mattress and storage place on both the sides of the bed. Bought from home center for 4000 with mattress only one and half year old. Panasonic microwave in excellent condition and very clean. Walnut brown 2 wardrobe with double door bought from home center in excellent condition. 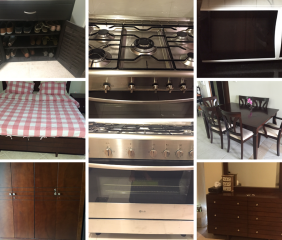 Walnut brown dining table bought from home center for 4800 aed in excellent condition and only one and half year old. HOW DO I CONTACT SELLER ON MELLTOO? 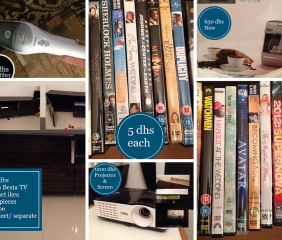 Gloss becta TV Cabinet on sale for AED 400. Bought from ikea. Two pieces attached and can be separated. Movie DVD Comedy/Action/Romance on sale, AED 5 each. Lcd Lg Monitor 22 Inch on sale for AED 100. Kenwood Hand Vacuum on sale for AED 60 each. Very convenient console. Mix of wood and metallic cover. We store keys, coins, visit cards, etc in the small drawers. Very nice white bookshelf for kids bedroom or other room. Very stable baby high chair with a vintage look! In good condition, it is perfect to store different sized items and feel organized: batteries, table clothes… At the same time, you can use the top for exposing pictures and souvenirs. 20mx1.2m. Very safe pool fence that we used for our baby girl. Moving to a house without pool. It was professionally installed and cost 9000Dhs. If you are interested, we can contact the supplier for you who will install it. This bookshelf comes from Sweden where it has been restored to get a shabby chic look but kept all its authenticity! We are moving and will not have space for this chest of drawers. Very convenient, we used it to store our baby’s clothes. HOW DO I CONTACT THE SELLER ON MELLTOO? Execlusively for Turkish Coffee lovers two pairs of phenominal Turkish set of cups for sale. Those branded items cultivates oriental blend in its decoration and fittings. Multiple shapes are available i.e. floral and semi plan. No chips no scratches at all. Check out the photos. For further details please pm me. Execlusively for Turkish Coffee lovers three pairs of phenominal Turkish set of cups for sale. Those branded items cultivates oriental blend in its decoration and patterns. Multiple shapes are available i.e. floral and gold plated semi plan. No chips no scratches at all. Check out the photos. For further details please pm me. All has to ho away by tomorrow Adorable multiple indoor plants for sale. Very well maintained in fancy ceramic and plastic pots from Ikea. Plants will be sold to best buyers. Hurry up and PM your offers now. WHY ARE YOU SELLING THESE ITEMS? Want to declutter your home? Nominate Yourself or a Friend today! Are you drowning in clutter and overwhelmed with stuff at home? Do you and your household staff struggle to find things when you most need them? Do you find it difficult to sell items you want to remove from your home ? If you’ve answered yes to the above questions, then you are eligible for a FREE Home Decluttering 1 hour taster session*. Step 1: Declutter your house! 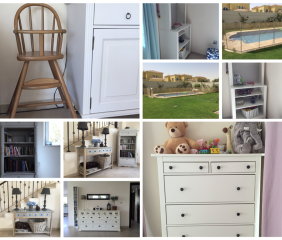 Shelina Jokhiya, a professional organiser, serial declutterer, entrepreneur and owner of Decluttr Me, will come to your home to declutter your home for 1 Hour for Free. Step 2: Turn your excess stuff into cash by reselling! The Melltoo MarketPlace team will help you price your decluttering items and turn them into cash by selling them on the Melltoo app. 1- Nominate Yourself or a Friend for a FREE 1 hour decluttering session in the comment box of this blog post. We will choose 3 of the entrants for a FREE decluttering session. 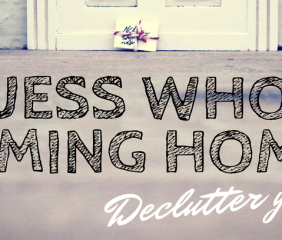 Posted on September 9, 2014 December 29, 2014 Author Ibrahima DiameCategories News & ViewsTags Clutter, declutter, Decluttering, Home, Tips5 Comments on Guess who’s coming home? Do you want to declutter your life? 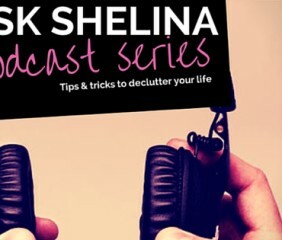 “Ask Shelina” is a podcast for anyone who wants to learn how to declutter their life, but doesn’t know where to start. It is hosted by Shelina Jokhiya, Founder of Decluttr Me, the first company in the UAE created to help people organize their lives and Melltoo Marketplace is the official organizer of the podcast series. Not sure what to do with all your excess stuff after decluttering? Melltoo Marketplace solves this problem by helping you promote your posts and connecting you with buyers. We even handle payment and delivery on your behalf! Decluttering in the UAE has never been this easy. Each episode brings you useful tips and tricks that you can implement today to become organized and live stress-free. Sean: Everyone, good afternoon, my name is Sean, and I am here with Ibrahim and Shelina from DeclutterMe. You are here this afternoon to talk about decluttering, basically, Shelina is the expert in the house and she is going to tell us everything and anything we need to know about decluttering because personally, I myself, I am new to this kind of thing. I did not even know something like this existed. Yeah, it’s exciting what she has to say – things she has been doing. What she has – the experience she has gotten so far from it, and the motivation behind it from the start to finish. What she has been doing up until now, she will just walk us through and tell us about everything. So, Shelina please just introduce yourself a little bit to the people. Let them know about you. Shelina: Hi, my name is Shelina, I as Sean said, I work at Deecluttr me. 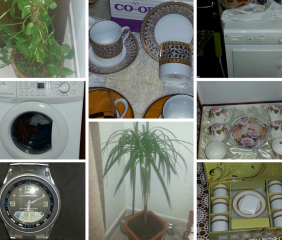 It’s a decluttering and organizing business for the UAE. So I go into people’s homes, get rid of their clutter with them and then create organized systems for them to be organized moving forward. That could be using storage boxes, labeling areas, labelling boxes, providing tips to the maids on how the systems will be working – so that they know how to be organized moving forward. And even training the kids and the husband, because they are the ones who can’t find anything, or make the mess – especially the kids, so they get trained on how to put their toys back into the right places at the end of the day. And that’s how I work. It’s been running for a year, and I’ve been working with various clients around the country helping them out to get organized. Sean: Wow, wow, ok. So the first time you told me about this, I was stunned basically, I am still stunned now that you actually do this, it’s amazing for me personally. You have told us basically what it is about, but I would just like you to tell us a little bit more about the history, how it started, what motivated you, what inspired you to do this, to go into decluttering? Shelina: I started; well I have always been like this. I have always been organized, which my parents have been frustrated with. So, I always organized at home and being neat and tidy. And then I was a solicitor, a lawyer for thirteen years and every company I’ve worked for, all legal filing systems have always been reorganized by me, because they were a mess before. So I’ve made sure everything was in the proper way archived, shredded what needed to be shredded, and that there was not accumulated paper everywhere. And in my last few years of being a lawyer I was a compliance officer as well, so I had to make sure that everybody complied around with – around the world – with the regulations for the group company. So that’s my background. So it has always been in me and then I have had the compliance side and the legal side. So I understand what is required for health and safety and for other regulations within this country and for other countries as well. Sean: It’s ok it’s fine. Ok, well, knowing that is how you started, like you just said, you worked basically in the corporate world, but then you could not help but bring out that sense of orgainzing in you and you just used it basically to go on. Sean: My question again is this, how did you find it easy to just transition from corporate to doing this, because basically you’re are a start-up on your own? How was it for you, how was the journey? Sean: Of course, of course, thank you. My next question is this – seeing as you have just told us of how it’s gone within a year – how that you have grown, how you’ve found ways to introduce this to people. Because it is a new concept like you said here in the region. What has been the acceptance so far, how have people taken to DeclutterMe, how have they accepted decluttering as a content? Shelina: Alot of people have heard of it before. They’ve seen programmes from the UK and the USA about decluttering and orgainzing. Especially programmes like Hoarders. So a lot of people they’ve gone, “Oh, I’ve have heard of this.” And then gone, “Oh we did not know there was a business here. Some people have needed educating, and not understanding decluttering. It seems to be a very new word for a lot of people. But I’ve used various forms of advertising. I’m big on Social media, so I’m on all the big social accounts – Twitter, Facebook, Instagram, Google plus, LinkedIn – and that is just a few of them, so YouTube as well. So I am everywhere, and I post every day, and I give tips to my followers and give advice and talk to them, and get clients from that. So they see what I can do, and then they use my services. But it was a long winded process and it takes a while to do it and to get out there. But it’s satisfying at the end when we get clients and you get them happy with the results at the end, then it’s all worth it. Sean: Ok, wow, again personally, I do think you are doing something really, really amazing here. And from what you have told us so far it’s – do not only have collaborators, but you have people working with you, because this looks like something hands on. It’s not you can’t – I do not know how you’re do it, but it’s amazing, how you go into places and get things organized. But I just want to know, what is the man power like for you? How do you get assistance from the people, heavy lifting, because obviously they are going to have heavy things I’m assuming? Shelina: It does, I’ve been lucky. Most of my clients, they have maids so they help a lot. And they have to anyway, because they’re in the house and in the areas and they know how the house works so they help me a lot. But I work with the client directly. It’s a personal thing to let somebody into your house. It’s tough, and to let them see how your house is. So it is a mental and physical thing, so I don’t have assistants with me or anybody come and join in. It’s just me and the client and the household. Most of the things I can do. If I need help, or if there is a lot of heavy lifting, then we can always hire a freelancer to come and help if we do not have the resources. But generally, it is just me by myself helping the client. Sean: Thank you very much Shelina. We are happy to have you here. We are very, very glad that you have spent some time to talk to us about this. Shelina: Thank you for having me. Sean: You’re are welcome. We definitely hope to have more of these podcasts. Unfortunately we cannot continue with this section because time is of the essence, I mean, you are a very busy person, I can tell. Sean: So on our next podcast, we will be having you again hopefully and you will tell us more about Declutter ME and what you do, how you do it and where and when you do it. Hopefully you will be more prepared then. You’ve obviously given us so much insight right now, but we want to know more. I am sure the people will want to know more as well because this is a new concept. Sean: So, see you soon and thank you very much for coming.